Primula alcalina is a regional endemic, occuring only in east-central Idaho and adjacent Montana, where it is known from just one recently documented population in Beaverhead County on BLM and National Forest lands. Another population documented by a historical collection from 1920 by F. Rose has not been relocated. The extant location is actively grazed and the species may be vulnerable to impacts associated with cattle grazing and activities that alter the hydrology (irrigation, diversions). CommentLocal endemic of Beaverhead County, MT and adjacent Lemhi Co., ID. CommentInvasive weeds, and hydrologic and habitat alterations pose potential threats to known populations. Score 13 to 14 total points scored out of a possible 19. Primula alcalina is a fibrous-rooted perennial with a basal rosette of leaves and a leafless flowering stem. Leaves are 1-4 cm long, narrowly elliptic with wavy or toothed margins, and taper gradually to a short, winged stalk. The leaf surfaces may have white flake-like farina when young but become mostly glabrous with age. The whitish-green flower stem reaches 6.5-24 cm in height and terminates in an unbranched umbel bearing 3-10 white tubular flowers 4-7 mm long with deeply cleft lobes that are 3-5 mm in length. The bracts below the inflorescence are lanceolate, covered with white farina and 4-7 mm long. The calyx has 5 pointed lobes, and is white farinose and 4-6.5 mm long. Fruit is a capsule. Flowering occurs in May and early June, with fruiting from June to August and seed set in August or September. Primula alcalina is similar to the closely related P. incana. However, flowers of Primula incana are lavender in color and larger than those of P. alcalina. In addition, stems of P. alcalina are reddish, while those of P. incana are whitish. Leaves of P. alcalina are nearly glabrous below, but those of P. incana are densely covered with white flake-like hairs. The flowering time of the two species overlaps, but on average, Primula alcalina flowers earlier. Primula alcalina is a narrow endemic known only from a series of wet alkaline meadows at the headwaters of four spring-fed creeks in east-central Idaho. These include Summit Creek in Custer County, Texas Creek in Lemhi County, Birch Creek in Clark and Lemhi counties, and Eighteenmile Creek in Lemhi County. A historical (1936) collection is known from meadows near Monida, Montana, but has never been relocated and is considered extirpated. Idaho primrose is known from east-central Idaho and adjacent Montana. 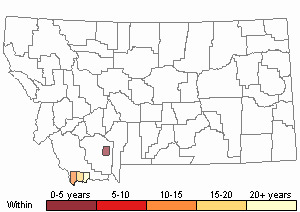 Six populations have been documented in Clark, Custer and Lemhi counties, Idaho, and one in Beaverhead County, Montana. 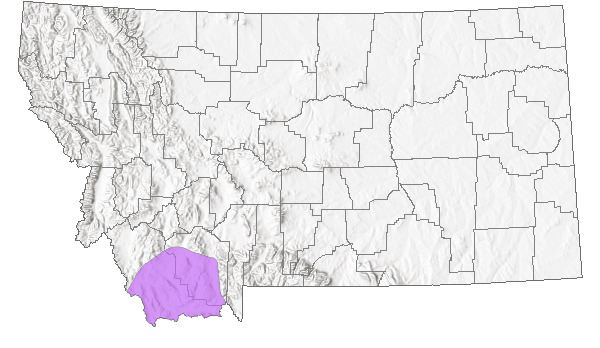 A second Beaverhead County population, observed at Monida in 1936, is presumed extinct. Primula alcalina is found in moist to wet alkaline meadows near headwaters streams at 6,300 to 7,200 feet elevation. The soil surface often displays hummock-hollow topography. Soils in the meadows are alluvial, alkaline, fine-textured, light-colored soils are derived from outwash of predominantly carbonate rocks of the Beaverhead, Lemhi, and Lost River ranges. Soil pH averaged 8.9-9.6 at study sites in Idaho (Moseley 1995). Common associates include Juncus balticus, Deschampsia cespitosa, Carex scirpoidea, Carex nebrascensis, Carex praegracilis, Agropyron trachycaulum, Muhlenbergia richarsonis, Senecio debilis, Crepis runcinata, Triglochin maritima, Dodecatheon pulchellum and Thalictrum alpinum. Potentilla fruticosa is common at some sites, primarily those with hummocks. Primula alcalina occurs in the lowest topographic positions in the meadows, where subirrigated soils are saturated to the surface throughout the growing season. Plants occur on low, relatively level benches immediately adjacent to creeks and spring heads, often on the inside of meander loops, and also on low benches with hummocky topography. Primula alcalina is often most abundant of the tops and sides of hummocks where the density of graminoids is lowest. Primula alcalina appears to be restricted to wet meadow habitats associated with relatively stable water tables. Associated streams have a fairly constant water flow, i.e., permanent flows with little flooding in spring (Moseley 1989; Mansfield and Miyasaki 1993). Soils remain moist to saturated throughout the growing season, but there is little or no inundation. On a very local scale, the density of Primula alcalina declines with increased abundance of rhizomatous graminoids such as Juncus balticus and Carex nebrascensis. Primula alcalina is often most abundant on the tops and sides of hummocks where the density of graminoids is lowest (Moseley 1989). Hummock habitats are moist without being wet and are more open than the wetter microhabitats dominated by sedges and rushes. Primula alcalina does not reproduce vegetatively. It is an obligate outcrosser (Cholewa and Henderson 1984; Kelso 1991) and is probably insect pollinated. Although specific pollinators are unknown, species of butterflies and bees have been observed visiting flowers (Fitts 1992). Seed dispersal mechanisms are unknown, however Kelso (1987) postulated for similar primrose species that seeds are shaken out of the capsules by wind or passing animals, and elongation of the flower stalks may increase dispersal distance. The one known Montana population of Idaho primrose lies both on private land and on public land managed by BLM. Most of the potential habitat on private land has not been surveyed. The entire known Primula alcalina habitat at this site is subject to cattle grazing. Livestock congregate near wetlands in the summer for the lush vegetation and proximity to water. The effects of livestock grazing on Idaho primrose are both psoitive and negative. Because the leaves of P. alcalina are all at ground level, livestock grazing can prevent seed production, however it will not kill the plant or remove significant photosynthetic tissue. Grazing can also be positive by partially removing the overtopping canopy of grasses and sedges, allowing more light to reach the leaf rosettes. Livestock grazing can also indirectly affect wetland vegetation by altering hydrologic regimes. Trampling by livestock may benefit many rare species by creating mesic microhabitats on the tops and sides of the hummocks. Hummock habitats are moist without being wet and are more open than wetter microhabitats dominated by sedges and rushes. Muir and Moseley (1994) found no significant association between grazing pressure and the abundance of P. alcalina. Lindborg and Ehrlen (2002) found that grazing is positively associated with the persistence of Primula farinosa, a closely related European species. Livestock grazing may also impact the habitat of Primula alcalina by altering hydrology. Upland grazing can reduce vegetation cover, increasing runoff, flash flooding and channel downcutting. The lowered water table that accompanies downcutting results in loss of wetland habitat and a decline in P. alcalina habitat. Loss of wetlands would likely result in population declines. This can be minimized by restricting livestock grazing to later summer in as many years as possible to reduce trampling and grazing on stream banks. Where necessary, grazing can also be managed to restore grass cover in the uplands. Restoration of willows (Salix planifolia, S. boothii, S. geyeriana) would be beneficial along Cabin and perhaps Simpson creeks. If willows can be reestablished, beavers may colonize and help resotre wetland habitat. Stream reaches with downcutting can be dammed to raise the local water table. Many of the permanent streams with habitat suitable for Primula alcalina have diversions for irrigation, and withdrawals during summer months may lower stream levels and the riparian water tables. Chronic dewatering will result in the loss of wetland habitat and a decline of Idaho primrose habitat. Beavers were present on these streams and probably common before Europeans entered the area. Beaver activity often expands wetland habitats by raising the water table and trapping silt behind impoundments. The long-term increase of wetland habitat might benefit Primula alcalina. Cholewa, A.F., and D.M. Henderson. 1984. Primula alcalina (Primulaceae): a new species from Idaho. Brittonia 36(1): 59-62. Elzinga, C. 1997. Habitat conservation assessment and strategy for the alkaline primrose (Primula alcalina). Idaho State Conservation Effort, Idaho Conservation Data Center, Boise, Idaho. Fitts, R. 1992. Primula alcalina, summary of field notes May, June and July 1992. Unpublished report. 4pp. Fitts, R. 1992. Reproductive ecology, establishment and evolution of Primula alcalina. A proposal for Challenge Cost Share Program, USDI Bureau of Land Management, Salmon District Office, Utah State University and faculty advisors for the project. 7pp. Fitts, R. Review of the genus Primula in light of the ecology of Primula alcalina. Unpublished report. 8 pp. Fitts, R. The reproductive efficiency of Primula alcalina in differing habitats. Unpublished report. 3 pp. Kelso, S. 1987. Systematics and biogeography of the arctic and boreal species of Primula. Ph.D. dissertation. University of Alaska. Fairbanks, Alaska. 53 pp. Kelso, S. 1988. Evolution in the genus Primula sect. Aleuritia: isolation, secondary contact, polyploidy, and homostyly. In: abstracts for the American Institute of Biological Sciences meeting, Systematics section: Davis, California. [place of publication unknown]: American Institute of Biological Sciences: Abstract No. 602. Kelso, S. 1991. Taxonomy of Primula sects. Aleuritia and Armerina in North America. Rhodora 93(873): 67-99. Lindborg, R. and J. Ehrlen. 2002. Evaluating the risk of a perennial herb: demographic data versus historical records. Conservation Biology 16: 683-690. Mansfield, D. H., and H. Miyasaki. 1993. Analysis of the habitat requirements of Primula alcalina. Challenge Cost Share Project, Albertson College of Idaho and Salmon District, Bureau of Land Management. 84 pp. Moseley, R. K. 1989. Report on the conservation status of Primula alcalina, a proposed candidate species. Prepared for Idaho Department of Parks and Recreation. 32 pp. plus appendices. Moseley, R. K. 1995. 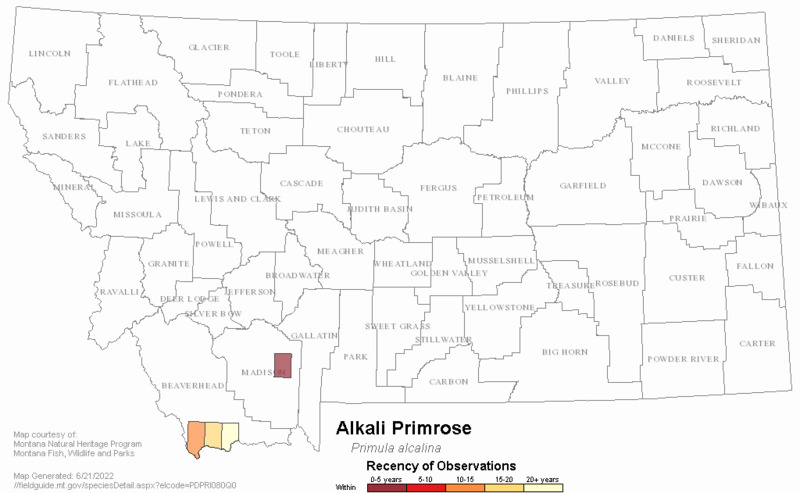 Demographic monitoring of Primula alcalina (alkali primrose): 1991-1994. Conservation Data Center, Idaho Dept. of Fish and Game. 27 pp. plus appendices. Muir, P.S. and R.K. Moseley. 1994. Responses of Primula alcalina, a threatened species of alkaline seeps, to site and grazing. Natural Areas Journal 14:269-279. Web Search Engines for Articles on "Alkali Primrose"